Yes, many call OneTrueFan as the Website version of FourSquare. It allows your visitor to check into your website either manually or by turning on the Automatic Check-ins option for your site/page. But the thing here is, the people visiting your site must have a OneTrueFan addon/widget installed on their respective browsers. I love its concept. Though I would never compare it with FourSquare as it totally functions on a different level. OneTrueFan is just a start-up which is still in its BETA Stage. Before yesterday it was just allowing certain premium users to sign. But from yesterday it’s allowing all the users to sign-up & install their browser add-ons. 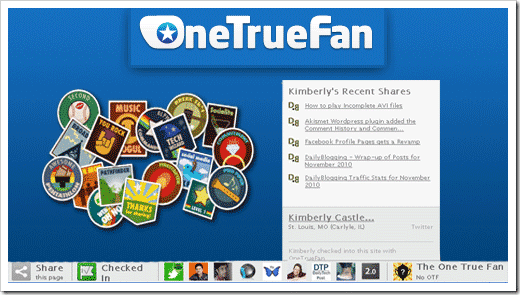 Automatic Check-ins : With OneTrueFan you can enable Automatic Check-ins to a particular site/page. Social Sharing : It has an option to share the pages you visit. But unfortunately this sharing is limited to only Twitter / Facebook / Delicious account which you connect with OneTrueFan in their Settings page. Win Patches (Accomplishments) : By fanning a site or being active in sharing pages, you get to win patches which are of different levels. For example : If you’re an Avid Social Media sharer, then you win a Social Media Expert award. The One True Fan : When you Check into a website, you win some OTF (One True Fan) points. The more you check-in, the more the points you win. If you are in the Top 10 list of OTF points, then you’re in the featured list & you get to see your name in the OTF bar when you visit their Website. So what are you waiting for, Download the addon for Chrome & Firefox. So do you like the idea of OneTrueFan ? Do you think it can survive for a long time ?? Interesting post, thanks for your tips and insight. One True Fans, this looks really great! Will check it out right after this.